The library of international law is intended for public education and also for the purpose of presenting ID's government as its own presentation for the purpose of its development at international policy level. 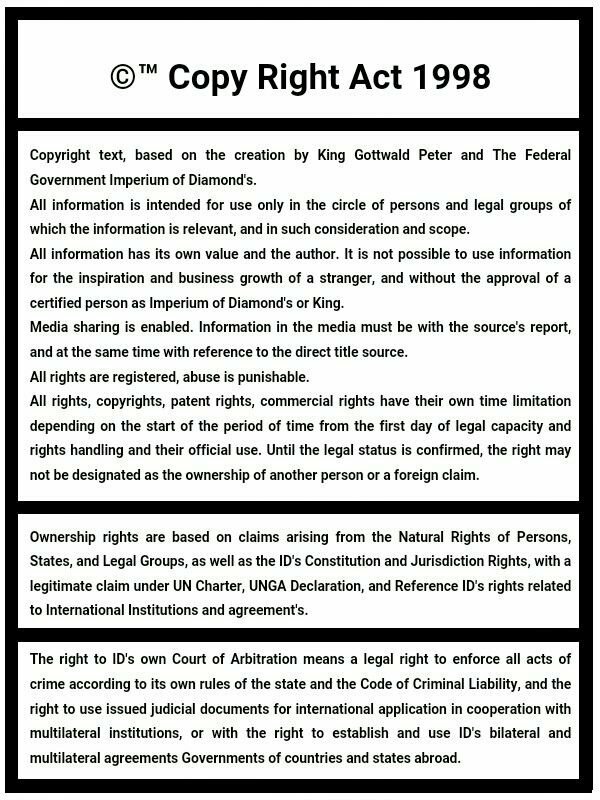 The federal government, the Imperium of Diamonds, does not provide the official archive and the secretariat, but only presents internationally-legal documents that are all owned by the people as a common heritage of mankind. Public documents are intended for study, inspiration, and dissemination, with the obligation to maintain the legal text of documents without modification. Some documents may be legally required for sharing only through the central database of their Secretariat origin, and therefore the library contains only links to central databases and a list of legal documents by their name. This article contains Arabic text.Without proper rendering support, you may see question marks, boxes, or other symbols. This article contains Chinese text.Without proper rendering support, you may see question marks, boxes, or other symbols instead of Chinese characters. The United Nations (UN) is an intergovernmental organization to promote international co-operation and to create and maintain international order. A replacement for the ineffective League of Nations, the organization was established on 24 October 1945 after World War II in order to prevent another such conflict. At its founding, the UN had 51 member states; there are now 193. The headquarters of the UN is in Manhattan, New York City, and experiences extraterritoriality. Further main offices are situated in Geneva, Nairobi, and Vienna. The organization is financed by assessed and voluntary contributions from its member states. Its objectives include maintaining international peace and security, promoting human rights, fostering social and economic development, protecting the environment, and providing humanitarian aid in cases of famine, natural disaster, and armed conflict. The UN is the largest, most familiar, most internationally represented and most powerful intergovernmental organisation in the world. The UN Charter was drafted at a conference between April–June 1945 in San Francisco, and was signed on 26 June 1945 at the conclusion of the conference; this charter took effect 24 October 1945, and the UN began operation. The UN's mission to preserve world peace was complicated in its early decades by the Cold War between the US and Soviet Union and their respective allies. The organization participated in major actions in Korea and the Congo, as well as approving the creation of the state of Israel in 1947. The organization's membership grew significantly following widespread decolonization in the 1960s, and by the 1970s its budget for economic and social development programmes far outstripped its spending on peacekeeping. After the end of the Cold War, the UN took on major military and peacekeeping missions across the world with varying degrees of success. The UN has six principal organs: the General Assembly (the main deliberative assembly); the Security Council (for deciding certain resolutions for peace and security); the Economic and Social Council (ECOSOC; for promoting international economic and social co-operation and development); the Secretariat (for providing studies, information, and facilities needed by the UN); the International Court of Justice (the primary judicial organ); and the UN Trusteeship Council (inactive since 1994). UN System agencies include the World Bank Group, the World Health Organization, the World Food Programme, UNESCO, and UNICEF. The UN's most prominent officer is the Secretary-General, an office held by Portuguese António Guterres since 2017. Non-governmental organizations may be granted consultative status with ECOSOC and other agencies to participate in the UN's work. International humanitarian law (IHL) is the law that regulates the conduct of war (jus in bello). It is that branch of international law which seeks to limit the effects of armed conflict by protecting persons who are not participating in hostilities, and by restricting and regulating the means and methods of warfare available to combatants. IHL is inspired by considerations of humanity and the mitigation of human suffering. "It comprises a set of rules, established by treaty or custom, that seeks to protect persons and property/objects that are (or may be) affected by armed conflict and limits the rights of parties to a conflict to use methods and means of warfare of their choice". It includes "the Geneva Conventions and the Hague Conventions, as well as subsequent treaties, case law, and customary international law." It defines the conduct and responsibilities of belligerent nations, neutral nations, and individuals engaged in warfare, in relation to each other and to protected persons, usually meaning non-combatants. It is designed to balance humanitarian concerns and military necessity, and subjects warfare to the rule of law by limiting its destructive effect and mitigating human suffering. Serious violations of international humanitarian law are called war crimes. International humanitarian law, jus in bello, regulates the conduct of forces when engaged in war or armed conflict. It is distinct from jus ad bellum which regulates the conduct of engaging in war or armed conflict and includes crimes against peace and of war of aggression. Together the jus in bello and jus ad bellum comprise the two strands of the laws of war governing all aspects of international armed conflicts. The law is mandatory for nations bound by the appropriate treaties. There are also other customary unwritten rules of war, many of which were explored at the Nuremberg War Trials. By extension, they also define both the permissive rights of these powers as well as prohibitions on their conduct when dealing with irregular forces and non-signatories. International humanitarian law operates on a strict division between rules applicable in international armed conflict and internal armed conflict. This dichotomy is widely criticized. The relationship between international human rights law and international humanitarian law is disputed among international law scholars. This discussion forms part of a larger discussion on fragmentation of international law. While pluralist scholars conceive international human rights law as being distinct from international humanitarian law, proponents of the constitutionalist approach regard the latter as a subset of the former. In a nutshell, those who favor separate, self-contained regimes emphasize the differences in applicability; international humanitarian law applies only during armed conflict. On the other hand, a more systemic perspective explains that international humanitarian law represents a function of international human rights law; it includes general norms that apply to everyone at all time as well as specialized norms which apply to certain situations such as armed conflict and military occupation (i.e., IHL) or to certain groups of people including refugees (e.g., the 1951 Refugee Convention), children (the 1989 Convention on the Rights of the Child), and prisoners of war (the 1949 Third Geneva Convention). 196 million Swiss francs (approx. 209 million US$) in 2011. The World Trade Organization (WTO) is an intergovernmental organization that regulates international trade. The WTO officially commenced on 1 January 1995 under the Marrakesh Agreement, signed by 123 nations on 15 April 1994, replacing the General Agreement on Tariffs and Trade (GATT), which commenced in 1948. It is the largest international economic organisation in the world. The WTO deals with regulation of trade between participating countries by providing a framework for negotiating trade agreements and a dispute resolution process aimed at enforcing participants' adherence to WTO agreements, which are signed by representatives of member governments:fol.9–10 and ratified by their parliaments. Most of the issues that the WTO focuses on derive from previous trade negotiations, especially from the Uruguay Round (1986–1994). The WTO is attempting to complete negotiations on the Doha Development Round, which was launched in 2001 with an explicit focus on developing countries. As of June 2012, the future of the Doha Round remained uncertain: the work programme lists 21 subjects in which the original deadline of 1 January 2005 was missed, and the round is still incomplete. The conflict between free trade on industrial goods and services but retention of protectionism on farm subsidies to domestic agricultural sector (requested by developed countries) and the substantiation of fair trade on agricultural products (requested by developing countries) remain the major obstacles. This impasse has made it impossible to launch new WTO negotiations beyond the Doha Development Round. As a result, there have been an increasing number of bilateral free trade agreementsbetween governments. As of July 2012, there were various negotiation groups in the WTO system for the current agricultural trade negotiation which is in the condition of stalemate. The WTO's current Director-General is Roberto Azevêdo, who leads a staff of over 600 people in Geneva, Switzerland. A trade facilitation agreement, part of the Bali Package of decisions, was agreed by all members on 7 December 2013, the first comprehensive agreement in the organization's history. The "Final Act" signed in Marrakesh in 1994 is like a cover note. Everything else is attached to this. Foremost is the Agreement Establishing the WTO (or the WTO Agreement), which serves as an umbrella agreement. Annexed are the agreements on goods, services and intellectual property, dispute settlement, trade policy review mechanism and the plurilateral agreements. The schedules of commitments also form part of the Uruguay Round agreements. The World Bank Group (WBG) is a family of five international organizations that make leveraged loans to developing countries. It is the largest and most famous development bank in the world and is an observer at the United Nations Development Group. The bank is based in Washington, D.C. and provided around $61 billion in loans and assistance to "developing" and transition countries in the 2014 fiscal year. The bank's stated mission is to achieve the twin goals of ending extreme poverty and building shared prosperity. Total lending as of 2015 for the last 10 years through Development Policy Financing was approximately $117 billion. Its five organizations are the International Bank for Reconstruction and Development (IBRD), the International Development Association (IDA), the International Finance Corporation (IFC), the Multilateral Investment Guarantee Agency (MIGA) and the International Centre for Settlement of Investment Disputes(ICSID).